Reading and share top 1 famous quotes and sayings about Feegles by famous authors and people. Browse top 1 famous quotes and sayings about Feegles by most favorite authors. 1. "She folded her arms and then shouted, "Right you thieving scunners! How dare you steal Miss Treason's funeral meats! ""Oh, waily, waily, it's the foldin' o' the arms, the foooldin' o' the aaaarmss!" cried Daft Wullie, dropping to the ground and trying to cover himself with leaves. 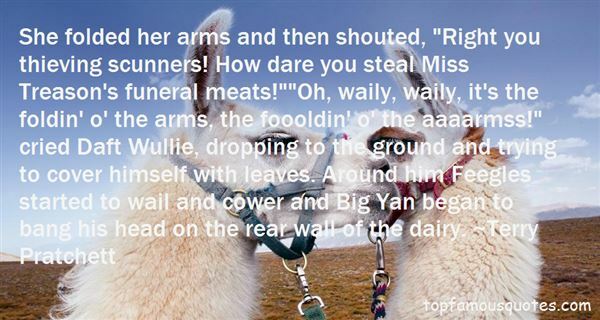 Around him Feegles started to wail and cower and Big Yan began to bang his head on the rear wall of the dairy." Careful, even now, not to thank the wights, she added, "You have all been most kind."